Delivery of a safe can be a complicated and difficult process. 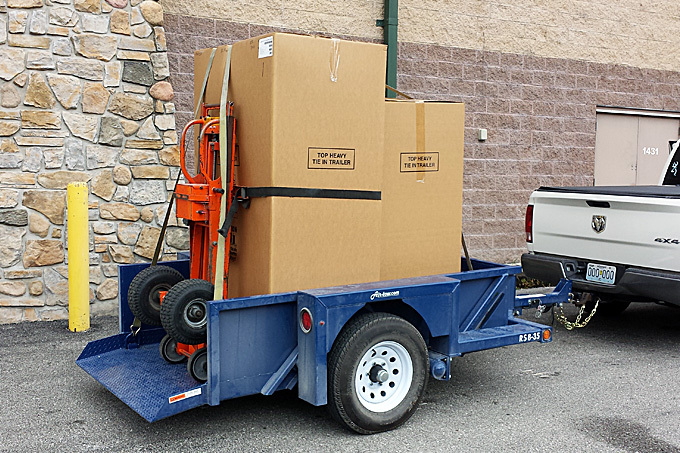 We offer a trained professional delivery crew as well as expensive safe moving equipment. Even with the proper training and equipment, the safes don’t flex, so we need the proper amount of space to allow our equipment to work. This is to assure a safe delivery with no damage to your new safe, home, or our delivery crew. We work hard at keeping our delivery costs as low as possible. This makes buying a safe easier and more affordable. – In all cases we are as careful as possible! We also SELL New and Used Safes, Buy Safes, and carry Accessories. If you’re considering a new or used safe, or need accessories, we can help. Look over our selection in the PRODUCT section. We also purchase quality used safes if you have no longer have a need for yours. Use the CONTACT US form, or CALL US today for a FREE estimate! Good day! I just wanted to drop you a brief follow up letter to thank you for moving my safe from Adventure Shooting Systems in Chesterfield Valley to my home in Chesterfield, Mo. I would especially like to thank you for moving it from my driveway to my basement and dealing with all of the extremely difficult circumstances including challenging angles at the top of a flight of stairs and than down to the basement area all without damaging anything. This feat is something that I do not believe any other safe mover in the St. Louis area would have been able to accomplish and I would highly recommend your safe moving services to anyone who is making an investment and not experienced with this work.